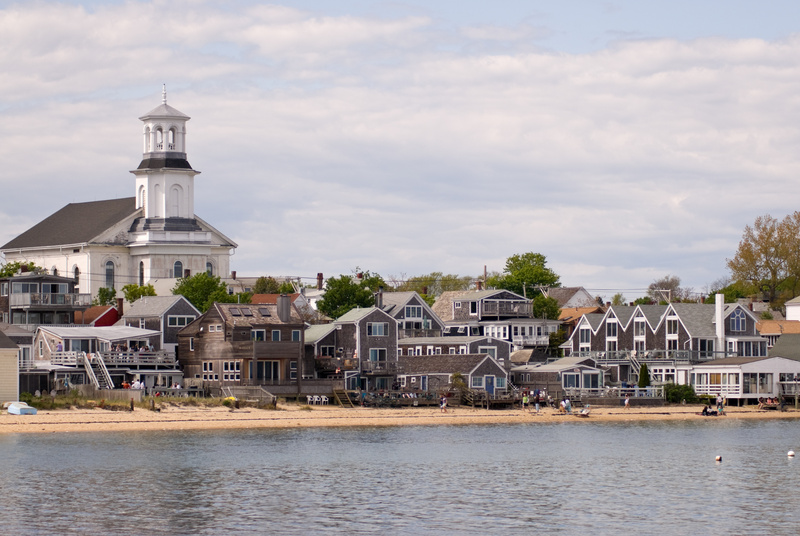 Welcome to Provincetown, one of the most different and extraordinary areas of the United States, situated on a stretch of sand surrounded by water at the tip of Cape Cod. The simplest way to get there is to take Route 6 to the end, at 42 degrees north, 70 degrees west. You’ll find a blend of Greenwich Village, New York and Key West, Florida. A tourist destination for 100 years, this small coastal New England town always attracts artists, authors, and lovers of nature on a quest for beauty, solitude, and light. Only 50 miles by boat and 100 miles via car from Boston, “Ptown – its local nickname – is a popular destination for a number of vacationers. Also one of the preferable destinations for gays and lesbians, because of its tolerance, the town breathes the freedom of itself. Its two main “arteries”, or streets, are Commercial Street with its bordering restaurants, charming hotels, boutiques; the second is Bradford Street, which is more tranquil and sets the tone of the natural and sumptuous protected lands that surround it. In the summer, the town becomes a chic enclave, at once wild, urban, and bohemian with its hipster bars and artistic and vibrant life. Culturally, Provincetown is a concept, a vivacious idea, an institution of thought, a place for free imagination, creativity, pleasure, liberty, and equality. Though it can be a little crazy in the summer, Provincetown is anchored in the history of the United States: it was November 11th, 1620, when the Founding Fathers/Pilgrims of the Mayflower ship threw their anchor in the port of Provincetown. They explored the region for five weeks before following their research in finding a site more favorable to establish a colony. It was here that the Pilgrims wrote and signed the Mayflower Compact, considered as the first document in the New World, shifting towards a new democracy. The first habitants of the town made a living by commercial fishing, and it was these Portuguese fishers principally from the province of Açores, who arrived in great numbers to profit from the flourishing fish. Today the Portuguese community is very present, for example, in the Provincetown Portuguese Festival, which takes place in June. Provincetown became a tourist town in 1899, when Charles Hawthorne opened the School of Art there, taking with him hundreds of artists from Greenwich Village in New York. Following actors and writers, who comprised of Eugene O’Neill and Susan Glaspell, started plays in Provincetown and contributed to the birth of American theater. In the 1940s and ‘50s, the discotheque of Provincetown hosted artists such as Ella Fitzgerald and Billy Holiday. Montgomery Clift, Marlon Brando, and Richard Gere performed at certain moments in their career here. Pulitzer Prize laureate Norman Mailer wrote one of his cult novels in Provincetown. All of these events and these people created a constant flux of progressive thought; these liberal and sometimes revolutionary ideas that continue to nourish the creative motor of the oldest artistic colony in America. This equally created an environment that is not only tolerant and accepting, but also celebrates gay, lesbian, bisexual and transgendered life, well before most other areas in America, witnessed by the world. The crucial presence of the LGBT community is apparent in the history of this town. Poet Edna St. Vincent Millay, a precocious feminist, appreciated the open sexuality of the town, where she and her husband explored the ideas of “free love”, well before the hippie era. Tennessee Williams fell in love for the first time in Provincetown, and came here regularly to heal his broken heart from numerous lovers. Mary Oliver, Pulitzer Prize winner, wrote about her relationship with her partner here unlike Nobel laureate Michael Cunningham, who describes with verve and brilliance the experience of gay men in his worldwide famous novels. Provincetown is not just a “gay tourist town,” rather, it is an important melting pot of LGBT culture through a social, artistic, and political lens. All that being said, Provincetown is a small and agreable town for whoever likes freedom, culture, nature, simple pleasures, and whether one is heterosexual, homosexual, single, in a couple, with a family. So, the day can be centered around visits to art galleries, listening to writers’ conferences, or eating in some of the best restaurants of the region; the visitor can also spread him or herself out on miles of magnificent beaches, amuse oneself at the daily Tea Dance, and meet such a mixture of different people. The night offers all the amusements you can imagine: drag queen shows, magicians on the street, Thorton Wilder productions, concerts of the best underground artists…While Provincetown has several faces following the seasons – a year-round population of 3,500 people – the town reaches 50,000 regularly in the summer. Amongst the tranquil nonchalance to a buzzing hum, this transfiguration succeeds and is magical because, despite coming from different social and cultural classes, people are lively, working and playing together to create one of the most dynamic and diverse communities in America. Naturally beautiful, its abounding culture and entertaining scene, three miles charged with art galleries, shops, restaurants, and a variety of lodging options, Provincetown is an area amazing to visit and to explore. You will just love it! Provincetown Promotional Video from LIPTV1 on Vimeo.